Ever want to know just the quick, simple details of a book? The Lowdown is just that: just the gist, just an overview. Let me know in the comments if you'd like to join in on The Lowdown fun! If so, I'll create a linky for next week's Lowdown! For both Cinder and Scarlet. You can click here for my review of Cinder. "Scarlet Benoit and Wolf, a street fighter who may have information about her missing grandmother, join forces with Cinder as they try to stay one step ahead of the vicious Lunar Queen Levana in this story inspired by Little Red Riding Hood." Close third person switches between Scarlet, Cinder, Prince Kai and I believe just one other character (don't want to spoil who!) throughout the book. France, New Beijing, and once again not to spoil anything, a few other places as well! Scarlet: Brave, persistent and incredibly loving. Cinder: Sarcastic, intelligent and independent. 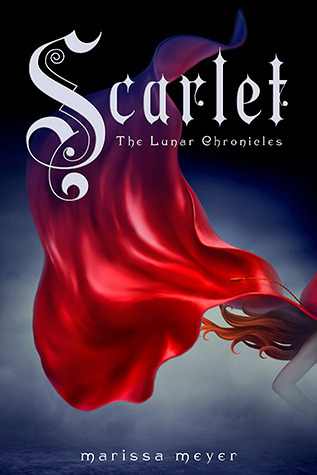 Scarlet is just as, if not more, incredible than Cinder (the first book in the Lunar Chronicles) which I didn't think could be possible. I absolutely loved that I was still able to follow closely along with Cinder's adventure while also being introduced to new characters and their stories. Filled with unexpected twists and action packed scenes, I had an impossibly hard time putting this book down. With Scarlet Marissa Meyer once again creates an amazing world with her incredibly writing style. I'm absolutely dying to get my hands on book three, Cress, which introduces a new character based off Rapunzel that's trapped on a satellite! The Lunar Chronicles is definitely one of my all time favorite series that I find myself always going back to reread. I definitely recommend! Check out Scarlet on Amazon and Goodreads!